The Christmas Fair is almost upon us and we are pleased to say that preparations are going well. It looks like it will be a fabulously festive event with lots of stalls for you to buy those Christmas treats at. For the first time ever, we have asked the classes to create and run their own stalls. Hornbeam class are running the Make and Take stall where you can make masks and decorate ceramic ornaments for your tree. You can also Guess How Many Baubles are in the jar to win a prize. Beech class Fun Photo Booth. Pop along and use the props to have a funny festive photo taken and see if you can find What’s Hiding Under Santa’s Hat? for a chance to win a Lucky Dip Prize. Ash class Animal Treats stall have made delightful treats for caring for our bird and doggy friends over the winter. Rowan class are making delicious Gingerbread Treats and challenging you to Guess Who the Teacher is from a baby photo. You can also try your luck on the Tin Can Alley! Maple class are tempting you with Homemade Sweet Treats. Candy cane hearts, snowman poop and reindeer poop are sure to delight your taste buds. There will be a fun game of Pin the Nose on Rudolph too! Willow class will be challenging you to shoot down the targets in their Nerf Shooting Alley and also having you try your luck at finding Where is Santa Hiding? on their grid. The Cafe which will be selling tea, coffee, hot chocolate, mulled wine, wine, beer and squash, and some mince pies. Enter the raffle. Stand a chance to win one (or more) of 20 lovely themed gift hampers! Parent gift shop- send the children to buy a little secret present for you in the gift shop. Mellow Therapies Mellow therapies offers Swedish massage using organic Neal’s Yard oils by Katey French. House of BlueBelle Collections of luxurious Home, Bath and Body products. Across all of our collections our products are handmade in small batches, our candles are all hand-poured and for that added personal touch, every item is lovingly hand finished. Lego Space building competition, pop along and build your space ship to win a prize! Run by Woodcote resident and children’s author Sue Palmer. Wheeler’s Books, a great selection of books for young and old at very reasonable prices. *Please click on the links to see what these stalls will be selling. 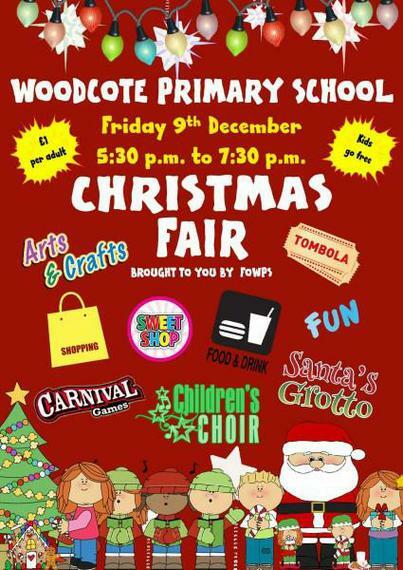 Doors will be opened by Father Christmas at 5:30 via the school foyer. We do hope you will all pop along and listen to the children’s choirs singing Christmas songs and carols, support their class stalls and get into the Christmas Spirit on Friday 9th December from 5:30-7:30.